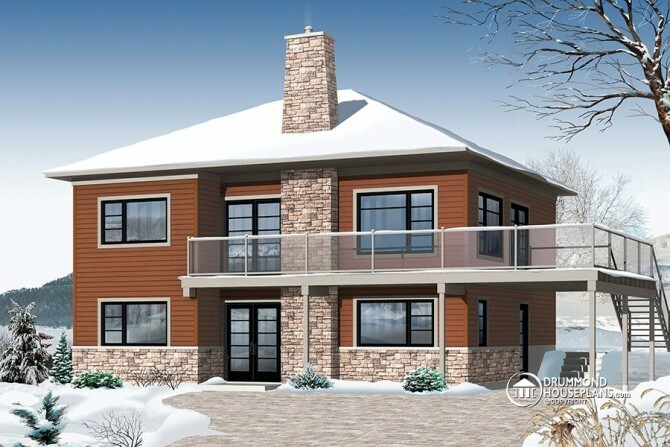 Inspired by model 2955, this contemporary chalet plan, # 3966 , has borrowed certain interior features of the original with a modern update on the outside. The designer has chosen a practical car port above which is an immense terrace that takes advantage of the breathtaking scenery offered by a lot with panoramic views which can be enjoyed on both sides. The main floor has a practical and inviting entrance foyer with generous closet space and a service entrance in a mud room with its own laundry area, a feature that is made to order for those who enjoy all kinds of outdoor sports! Two beautiful, secondary bedrooms with shared bathroom and a game/multi media room enhance the livability of this home and make it perfect for families with teenagers. The abundant fenestration of the second floor bathes it in natural light and it is accessible from inside and outside. There is an entirely open activities area with 9’ ceilings throughout, a central fireplace and a nicely sized, 84” x 40” kitchen island. The master bedroom has a walk-in closet and its own access to the well appointed bathroom. A stunning chalet that is built with all of the practical features that a larger family needs and room to give everyone their own “space”!